Bloodborne is quite the video game experience. The Playstation 4 exclusive works as a kind of spiritual continuation to the Dark Souls games, and it does indeed share much of the DNA of its sister series. But once one delves deeper into Bloodborne, it becomes clear that it is also a machine of its own. Those who are familiar with Hidetaka Miyazaki’s Dark Souls games should know the basics. It’s still a brutally difficult, 3D action-RPG with a Metroidvania setup. 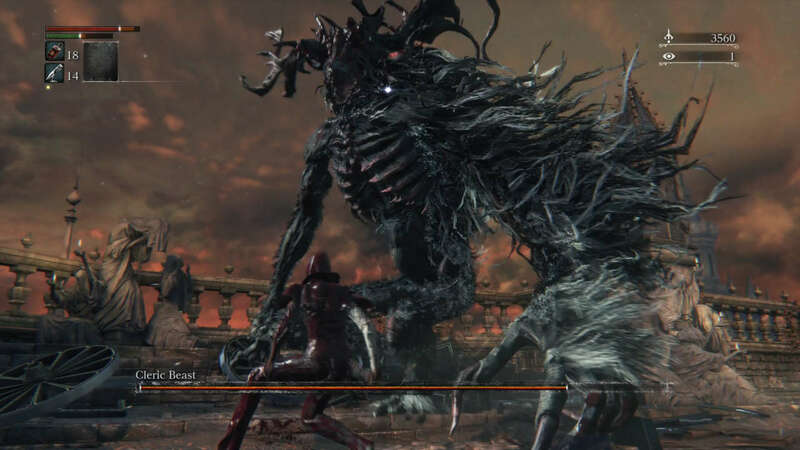 By defeating enemies, the player gains a number of Blood Echoes which, like the souls of the Souls titles, work as both experience points and currency. Players can use Blood Echoes to level up, buy weapons, items and gear, upgrade weapons, and so forth, all within a realm called the Hunter’s Dream, which acts as a kind of hub world. The immediate difference players will notice between the Souls series and Bloodborne is the setting. 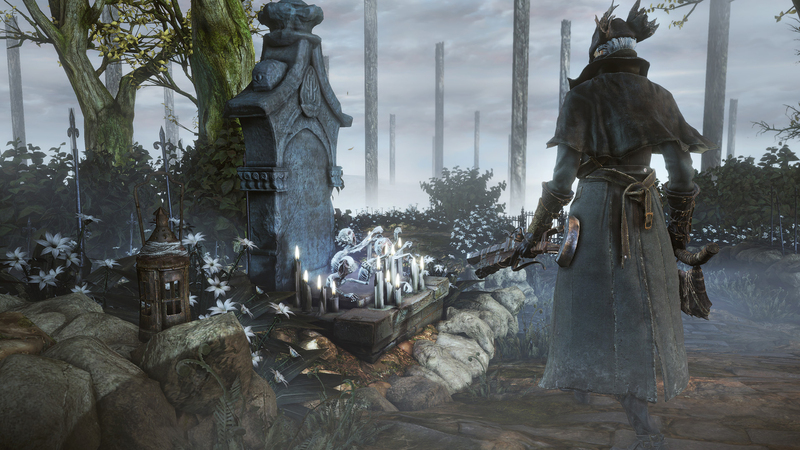 Bloodborne abandons the high fantasy of the Souls series in favor of horror-based inspirations. The game takes place in the city of Yharnam, a place famous for its medical advancements in “Blood Healing” (expect to hear the word “blood” quite frequently throughout). The player character, referred to as a “Hunter,” arrives in Yharnam in search of something called Pale Blood for reasons that are largely unexplained. The player picked the wrong night to arrive in Yharnam, however, as it is the night of “The Hunt,” in which monsters roam the streets and the denizens begin to go mad. The player must traverse Yharnam and the surrounding areas in order to survive the Hunt, and bring an end to the “Nightmare” at its source. Before you think Bloodborne merely swapped out goblins and dragons for vampires and werewolves, there is more to Bloodborne’s plot than the change in setting. Primarily, the game has quite a distinct and rich lore going for it, with a story that at first seems like gothic horror slowly growing to incorporate all kinds of horror genres, from cosmic to mystery. Perhaps the most interesting part of Bloodborne’s narrative is that it’s largely optional. Aside from a few short cutscenes, the player mainly finds out more about the story, world and characters by reading item descriptions, side quests and optional text scattered around. You can play the game with strong storytelling or go at it like a retro game and simply slash a bunch of monsters. The core gameplay is largely reminiscent of Dark Souls, with melee combat that is tight and intricate. But Bloodborne does make some meaningful changes to the formula, with a stronger emphasis on faster, smoother combat. The player’s stats have more or less been streamlined, with a smaller list of more defined attributes to worry about. More prominently, the weapons are weirder and more creative than those in the Souls titles. Melee weapons can switch between two different modes at the press of a button, making every weapon feel like two different ones. Players can even have secondary weapons (primarily guns), which can be used to stun enemies and cancel out some of their attacks. What’s great about the weapons (and armor) is that, unlike many other RPGs, you don’t simply replace older weapons with newer, better ones. The game allows for some flexible character customization, so some weapons are more tailor-made for specific attributes (like Skill, Strength, Arcane or Bloodtinge), but no weapon is substantially “better” than the others, and each one is pretty unique in play style among the rest, leaving players to simply choose which play style they find the most fun, and upgrade their weapons based on personal preference. Perhaps the best part of Bloodborne’s gameplay is how it continuously grows deeper the further you delve into the game. As it stands, the core gameplay is already immensely fun (if sometimes infuriatingly difficult), but as the game progresses you’ll learn magic spells, find runes that give you various bonuses, and gems to add new strengths to your weapons. There’s no shortage of depth or variety in gameplay, and this is reflected in the game’s world design. The different areas found in Bloodborne are a vast array of dark, dreary and atmospheric zones that house impeccable staging in enemy placement and hazards. And the way they all connect is a wonderful testament to the detail that went into the game. There are optional zones that are as extravagant as anything in the main story! For those who may want to take a detour from the main game, secret chalice dungeons can be unlocked in the Hunter’s Dream. The chalice dungeons may be a bit of a hassle to unlock, as each one not only requires their titular chalice, but a host of other crafting materials that are often hard to come by, making the process feel like a chore. But once you unlock said dungeons, they provide some of the game’s toughest challenges, and add a dash of Zelda-style fun to the equation. There’s really not a whole lot to complain about in Bloodborne. It’s an exceptionally well-crafted, deeply rich gaming experience. Though it should be said that if you’re not a fan of the sheer difficulty of the Souls games, then Bloodborne, even with its appreciated tweaks, probably won’t win you over. Though the game is a tremendous achievement in so many ways, Hidetaka Miyazaki definitely has a niche that he’s mastered, and it certainly isn’t for everyone. Though if you have too much trouble, you can always summon another player (or two) for backup, and the game is arguably at its best when played with a friend. Those who love Hidetaka Miyazaki’s work may even find the gameplay a little overly familiar, now that Dark Souls has become a franchise with multiple entries. Still, it’s hard to be too critical on Bloodborne, as it’s a terrific game that gets so much right. Great gameplay, wonderful world design and atmosphere, stunning visuals and a brilliant score come together to make a near masterful game. It’s the best entry yet in the Souls-style of games, even if it doesn’t bear the same name. Familiar as it may be to some, and alienating it may be for those who don’t do well with really difficult games, Bloodborne is nonetheless one of the best exclusives to be released on any Playstation console. For those with the patience for it, it’s well worth it. Great review. Love this game. Excellent review as always my friend! We should play sometime!! I’m in the middle of my new game plus playthrough, and am still discovering new intriguing things! My only gripe with the game would be its nonsensical story, which is existent in some shape or form for those who wish to find it I’m actually not a fan of the Souls’ series, so my adoration for Bloodborne was surprising to say the least. I’ve never been a fan of the medieval fantasy – dragons, elves, magic, Knights and other staples of high fantasy are prominent examples of gaming elements that don’t resonate me. I love bloodborne’s cadence to the Victorian era and its heavily gothic atmosphere that was evidently inspired by Van Helsing and Dracula. And its visceral combat is a step above the meticulous nature of dark souls’ gameplay. Without a doubt my favorite PS4 game! I’m sure I haven’t played nearly as many PS4 games as you have, but Bloodborne will definitely be a tough one to beat. I regret doing my Game of the Year when I was still early in the game and only placed it at 4. It would probably be 2 if I did it now (though it can easily flip-flop with Mario Maker). It is a fantastic game. Aside from Tolkien, I kind of feel the same way about the typical fantasy settings/creatures. I feel people use the same tropes far too often. The Victorian/gothic setting of bloodborne feels much fresher. I am excited for Dark Souls III, but I admit the series is risking over saturation. I have heard that Dark Souls III is going to be the “last entry” so I hope it goes out with a bang (of course, how often have we heard a game was going to be the “last” in a series, only for more entries to show up). I doubt I’ll be as wowed by it as I am for Bloodborne, but the series has been consistently good. I think it’s easy to name Tolkien as the exception to the rule when it comes to usual fantasy tropes and archetypes, since he used them meaningfully and uniquely to create his own world. It seems like most other high fantasy stories just use the same elements and expect the same results as Tolkien, but they lack the depth with their creation. 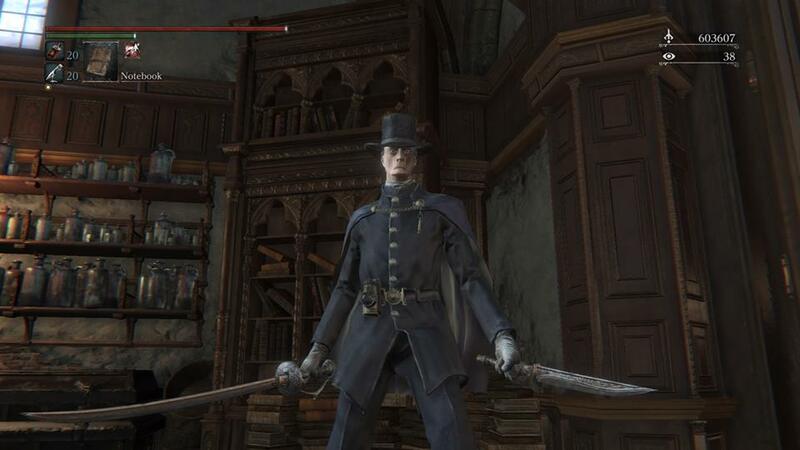 And yes, we should definitely play Bloodborne sometime. I have two characters, one of which I’ve nearly finished new game plus (the character in the first picture in this review, actually), and my second is still on the first playthrough.